Palo Alto approved a policy on March 18, 2019, for addressing sea-level rise, which could include new horizontal levees in the Palo Alto Baylands. File photo by Veronica Weber. With rising tides threatening to submerge the Palo Alto Baylands by mid-century, city officials agreed on Monday that they need to explore new barriers — both physical and legislative — to protect coastal area from sea level rise. These measures will be approved as part of a new Sea Level Rise Implementation Plan, a document that Public Works staff are in the process of putting together and that could have significant ramification for properties around the Baylands. The plan will evaluate, among other measures, zone changes in high-risk areas and new conditions for approving projects in these areas. It will also consider new Baylands structures to reduce the impacts of sea level rise, including horizontal levees. The new plan aims to address what city officials have identified as a glaring weakness in their recent drive toward environmental sustainability. While the council had recently adopted a new sustainability plan and selected "climate change" as a top 2019 priority, its planning on sea level rise has until recently been relatively minimal. Some council members, including former Councilman Cory Wolbach, have repeatedly advocated for more planning for sea level rise, prompting staff to proceed more aggressively on the topic. This includes the creation of a new sea-level-rise policy, which the City Council unanimously approved Monday night. The policy, in and of itself, does not create any new restrictions or propose new infrastructure. Rather, it recognizes that the best way to avoid long-term impacts from some of the most severe sea-level-rise projects is to continue to reduce greenhouse-gas emissions. It also commits the city to work with neighbors to coordinate a response to this expected calamity. The policy also represents a bridge between the city's broad sustainability goals and specific policies that the council will start debating next year, including zone changes and building standards. Public Works Director Brad Eggleston called the policy a "critical first step for responding to future rising tides caused by climate change that we'll be experiencing over the foreseeable future." "More importantly, it will be the springboard for developing a climate-adaptation plan that will protect Palo Alto," Eggleston said. The city also plans to conduct a vulnerability assessment to identify possible threats to critical infrastructure through the year 2100. According to California's Fourth Climate Change Assessment, a state study published in January, sea level in the Bay Area has risen by more than 0.6 feet over the past century. The assessment projects a sea level rise of up to 1.9 feet by 2050 and between 5.7 and 6.9 feet by 2100. At that level, tides would spread through the Baylands and threaten critical city facilities, including the Municipal Services Center, the animal shelter, the Elwell Court offices of the Utilities Department and the Regional Water Quality Control Plant. A map of projected sea levels in 2100 that the council saw Monday showed several neighborhoods on the east part of Palo Alto, including Duveneck/St. Francis and parts of Midtown, under between 2 and 4 feet of water. "We do know it is going on and we do know it's going on at an accelerating rate," Jeremy Lowe, a senior environmental scientist with the San Francisco Estuary Institute, told the council Monday. Lowe noted that there is inherent uncertainty in trying to project sea level rise, which depends in part on such factors as melting glaciers and failing ice sheets in south Antarctica. The situation, he said, could be a lot worse than what current estimates show. He also told the council that as sea levels continue to rise, so will the frequency with which extreme water events occur, such that 100-year floods (those that have a 1 percent chance of happening in a given year) become 50-year floods, which in turn becomes 20-year floods. "Sea level rise will continue and we must think that is now business as usual and we should plan accordingly," Lowe said. The council enthusiastically supported the policy, which calls for enhanced community engagement on sea level rise and an economic assessment of sea-level-rise vulnerability for public and private property (including cost estimates for inaction). But while there were no objections to the broad policy, city officials acknowledged that conditions will likely get more contentious in the future, when council members consider zone changes and other specific regulations for properties in flood-prone zones. "There could be zoning requirements on where new developments could occur at all. There could be requirements on heights at which new developments could occur," Assistant Public Works Director Phil Bobel said. Esther Nigenda, a member of the citizens group Save Palo Alto's Groundwater, was one of several residents who turned out to support the policy. She urged the city to go beyond the policy's long-term goals and adopt some of the near-term strategies that are included in the state guidelines. This includes ensuring that new developments are sited properly, prohibiting underground construction in expected flood zones and requiring electrical outlets to be placed above expected flood levels, she said. "There are a lot of small things we can start doing now so we can make sure the projects coming up in the next two years are able to withstand impacts of sea level rise," Nigenda said. The council agreed that the city should move with some urgency on the topic. Councilwoman Liz Kniss encouraged staff to move faster on the plan, with the goal of completing a draft by June 2020. Councilwoman Alison Cormack called the new policy an important development. "This isn't about panicking now," Cormack said. "This is about understanding. Every time we look to build something in this area, let's think about how long this particular asset is going to last and we'll base our decisions on that." It would be helpful to see the map of projected sea levels in 2100 referred to in the article. Would you please provide a link? @map: There's this really useful search tool, called Google [portion removed.] If you want to find articles on a topic that someone has mentioned you can type in some words related to the topic, for example [map projected sea level rise 2100 san francisco bay area], and see if it finds the item you're interested in. >> It would be helpful to see the map of projected sea levels in 2100 referred to in the article. Would you please provide a link? Agreed. A map should have been in the article. The Weekly should make it more routine to include maps and links to maps of all the geographical/zoning/etc discussions in articles. >> "There could be zoning requirements on where new developments could occur at all. There could be requirements on heights at which new developments could occur," Assistant Public Works Director Phil Bobel said. Elevations, that is. If we, the residents of Planet Earth, "perform the experiment" and burn all the coal, the approximate seacoast elevation is 70m/230 feet or so higher than current. e.g. Deer Creek Road at Page Mill. Anywhere uphill from I-280. "Councilwoman Liz Kniss encouraged staff to move faster on the plan, with the goal of completing a draft by June 2020. Councilwoman Alison Cormack called the new policy an important development." Hopefully this concern isn't tied into another global warming scare tactic as heavy seasonal rain + tides also play a major role in periodic flooding. Just ask anyone who resided in PA during that 1955-56 flooding. If one resides near the bay lands or adjacent to Louis Road perhaps flooding might be a concern under certain conditions. But to predict that most of Palo Alto will be underwater by 2010 is ludicrous. For the 'Chicken Little' mentalities, perhaps it is time to consider hiring a contractor to put your home up on stilts like they do in the Florida savannahs. Then buy a small boat with an outboard motor as your car will no longer be of practical use. You now have up to 80 years to plan for this. Emotional response, according to poster's beliefs. She/he "believes" the world is lying to her/him, trying to scare her/him. Science, and facts, tell us otherwise. re: the eventually rising bay levels: yes, there will be some immediate issues, mostly related flooding getting worse. Later, when poster is gone, and poster's children curse her/his apathy to fact, we will see economic catastrophe in the area - huge costs to be borne by locals for protecting massive infrastructure and property investments: two airports, SF downtown, most local water plants, salt intrusion into the agricultural delta, etc.. Someone high up on page mill road, or even with 'stilts' will still see massive economic impacts. But poster was able to mock science and facts, back in 2019, so it's all good. Enjoy your 'win'. Resources is a registered user. By the time the neighborhoods are flooded, city council will still be trying to figure out the best way to configure the train crossings. The insanity never ends in this town. 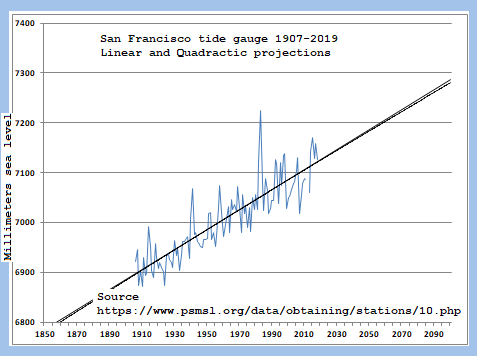 One week the Council wants to spend 1+Billion dollars to trench the rather useless Caltrain, and this week it seems to want to write a blank check to prevent sea level rise based on dubious projections that rarely seem to come true. In 2006, while promoting his movie “An Inconvenient Truth”, Al Gore said that humanity had only 10 years left before the world would reach a point of no return. Yet Gore’s critics point out that just a few years later, he bought an $8 million beach-front property near Los Angeles. It's doubtful that anyone on the Council has a degree in any kind of science, or anyone on the Staff pushing this nonsense. On the other hand, given how much money outside of Palo Alto was thrown at the last election (particularly for Cory Wolbach), no doubt the Council is genuflecting to the money stream that they will have to tap next year when the next election cycle begins. BTW--how many people reading this knew that Gore had purchased this expensive beach front house in SoCal? City Council should focus on Palo Alto needs... When averaged over all of the world's oceans, absolute sea level has risen at an average rate of 0.06 inches per year from 1880 to 2013. Since 1993, average sea level has risen at a rate of 0.11 to 0.14 inches per year. Taking information from both tidal records and satellites into consideration, the latest report from the Intergovernmental Panel on Climate Change concluded that sea level rose around 0.07 inches (1.7 millimeters) per year between 1901 and 2010. Doesn't seem too worrisome. Drop a boulder into the area being measured and you'll get a rise in levels. Better start stacking the sand bags. The Palo Alto Baylands will protect most of the city from rising sea levels (at least for some time), but what are Mountain View and Menlo Park going to do? They have built up the area right next to the shoreline. I bet the Google and Facebook buildings are already getting flooded basements during high tide. This is because by the time a mass extinction starts, the world would already be over." The conflation/lie that Gore's movie said Manhattan would be under water in ten years. These are the same ones who told us that Iraq has WMD, the ozone layer didn't have a hole, smoking is okay, etc.. Facts don't matter to their beliefs. I'm not sure if I missed it at first, but, there is a clickable map under the picture. (I also made a browser change just now that may have affected. Previous comment about maps-- thanks! Keep them coming. Most land-use discussions benefit from maps. 1) There have been five recognized (and maybe another that is just now being postulated) that occurred before man walked the earth. In plain language—man had absolutely nothing to do with these events. 2) Most of these events occurred over millions of years. Even if the Palo Alto City Council had been around during these events, there is ZERO possibility that this group could have done anything from the dais to avert these catastrophes. 3) The extinction even that end the reign of the dinosaurs now is fully established as the result of a large body impacting the earth’s surface. Recently, some researchers have postulated the possibility of another event within a year million years ago that resulted from a supernova’s explosion near our solar system. Again, not certain how much power the PACC has, but it’s doubtful they could stop a star from going supernova. 4) As to any on-going “mass extinction” that has been postulated by some—the claim that it’s too late again needs a lot of scrutiny. For instance, around the turn of the 20th Century, the American buffalo had almost been hunted into extinction. It became what we now call a “protected species” and now it’s numbers are large enough that its meat can be found in markets. Similar situation with some overfished stocks. Once the overharvesting stops, then stocks begin to replenish naturally. 5) Another point that people without earth science backgrounds might not fully appreciate—but for every species living on earth today, at least two species have previously come into existence and then gone out of existence—without man’s even being on the planet. Evolution and nature bring species into existence—setting the stage for the extinction of some lifeforms periodically. So, whatever sea level rise might be in Palo Alto’s future—it will not bring mass extinction to this little town. @podcasts - Here is exactly what Al Gore said in 2007. Let the audience judge whether you are the one being dishonest here. "Scientists in the US have presented one of the most dramatic forecasts yet for the disappearance of Arctic sea ice. Their latest modelling studies indicate northern polar waters could be ice-free in summers within just 5-6 years. Professor Wieslaw Maslowski told an American Geophysical Union meeting that previous projections had underestimated the processes now driving ice loss." "Last September 21, as the Northern Hemisphere tilted away from the sun, scientists reported with unprecedented distress that the North Polar ice cap is “falling off a cliff.” One study estimated that it could be completely gone during summer in less than 22 years. Another new study, to be presented by U.S. Navy researchers later this week, warns it could happen in as little as 7 years." @Resourses...I appreciated the humor of your comment. But, I think with the predicted consequences, CC should move quickly to approve the viaduct/trestle (elevated rail) option for all of Palo Alto, all the way from Palo Alto Ave to Charleston Rd in SPA. However, that might require hiring another consultant(s) to figure out how high it should be. These potential disasters will keep a lot of consultants and lawyers busy and in business for many years ahead, and far into the future. I'm actually happy to see this subject is being addressed and talked about. It is so easy for me, at age 82, to shrug it off as a problem that that other generation (two removed from me...looking forward) will have to deal with. I will leave my rubber raft and oars in the garage for future owners. lol! I'd like to hear more from PA Online...reporting about the pleading by homeowners at the CC meeting last night...those who might be affected by eminent domain for the grade separation solution. Real, imminent, and current day problems should be solved first. The perils, leading up to the end of our beautiful earth, can wait. We have more important things to deal with right now, in my town. Extinction is a natural part of evolution. Global warming a scare tactic. When you're dead, you're dead. Get over it. Who cares about saving the world for future human generations millions of years from now? Seriously. Those who survive a pending environmental catastrophe & have some semblance of intelligence will usher in the next dominant life form. Maybe it will be a fish with a high IQ that communicates telepathically & doesn't need various APPS & computers to do so. Or an amphibian-like creature. Who cares? Live for today. As to what Al Gore said in the past, it's a moving target--since none of his predictions have come true, other than his prediction of becoming inordinently wealthy from this scam, and he has been rewiting his history as often as he needed to. Immediately, after showing Florida, Gore showed animations of drowning cities and countries: San Francisco, The Netherlands, Beijing, Shanghai, Calcutta and then Manhattan. “But this is what would happen to Manhattan, they can measure this precisely,” Gore warned as he showed his audience much of the city underwater, including the area where the memorial would be built. Partially explains why the 2000 POTUS election was a complete farce. > whether you are the one being dishonest here. Even *that* is technically false - go yo your own link. Even given that - okay, Gore's hyperbole from 15 years ago hasn't fully played out. We all understand why deniers keep referencing him - 95% of scientists (excluding those paid by Big Oil) tell us Climate Change is REAL. So keep nitpicking Gore. It makes you happy, makes you feel your beliefs are warm and fuzzy, despite facts. Global temperatures in 2018 were 1.5 degrees Fahrenheit (0.83 degrees Celsius) warmer than the 1951 to 1980 mean, according to scientists at NASA’s Goddard Institute for Space Studies (GISS) in New York. Globally, 2018's temperatures rank behind those of 2016, 2017 and 2015. The past five years are, collectively, the warmest years in the modern record." Two birds, one stone. Elevated rail can easily be converted to a dam-structure to protect those west of the tracks from the impending floodwaters. According to the city staff and regional professionals, the ocean will rise 6 to 10 feet by 2100. This will cover 101 and neighborhoods adjacent 101 on both sides of 101. It should rise about one foot by 2050 which will have significant impacts on the Bay Lands. I'm still waiting (optimistically) for the city to significantly mitigate the flooding risks of the 1998 flood. "planning on sea level rise has until recently been relatively minimal"
Of course. "Safety Last", expensive vanity projects that make it look like we care about safety, first, as they like to say in our City Council and staff. I have. We are all doomed for extinction whether as human species or as individuals. Not going to lose any sleep over global warming. Perhaps biospheres will save those who wish to exist in a polluted environment. As for me, when the grim reaper calls, I won't take it personally. According to AOC and the other Socialist Democrats, we will all be gone by then. "The world is gonna end in 12 years if we don’t address climate change and your biggest issue is how are we gonna pay for it?" Don't you remember you bunch of cheapskates, it is our generations' WW2. So why is the Saltworks back on Redwood City's agenda - 30,000 people and offices on the old salt pond with an average elevation of 0? Why are Facebook and Google expanding in areas which even today require extensive levees? And while I believe in green belts, given the need for housing, we need to consider rezoning the areas between Foothill and within 1/2 mile of 280 for medium density housing (ie the cheapest cost of building) and preserving the foothills belt beyond 280. That area could easily be connected to major job centers using private bus shuttles and bikeways such as Stanford Research Park (the largest office park in Palo Alto), Stanford, Stanford Hospital and Shopping Center and downtown Palo Alto/Palantir etc etc. Gennady Sheyner reports sea level rise of "<i>1.9 feet by 2050 and between 5.7 and 6.9 feet by 2100.</i>"
That comes to 18, 21 & 26 millimeters per year respectively. just to the north of Palo Alto tells us that since 1999 the rate of sea level rise has been about 6 mm/yr. Longer running tide gauges at NAS Alameda and San Francisco show 5 mm/yr and 4.5 mm/yr over that same stretch of time. The San Francisco gauge shows that since 1855 the 19 year rate has been as high as 6.7 mm/yr (1878) and has been negative (-0.3 mm/yr.) as recently as 2014. 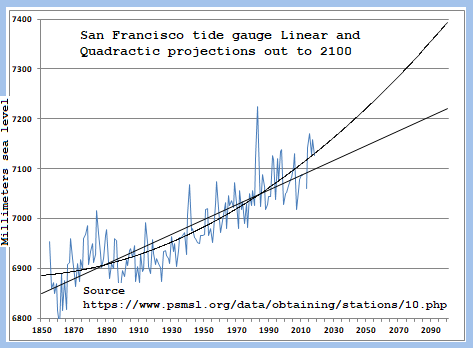 The tide gauges show no evidence for rates increasing to 20 millimeters per year. That's an extraordinary claim. The public works staff and the city council should be asking some very hard questions of the people who put out California's Fourth Climate Change Assessment. For those worried about melting Arctic ice, I recommend the following experiment instead of listening to alarmists. 1) Add ice cubes to an empty glass, and fill with water till the ice floats. 2) Mark the location of the water level. 4) Now, try to explain why the water level did not rise. > 4) Now, try to explain why the water level did not rise. Frozen water displaces its own mass in the rest of the water, which means in effect it displaces an amount equal to itself. While frozen it is larger in volume, and thus less dense, because of hydrogen bonding -- that's why it floats -- and when it melts it returns to the liquid state (surprise!) at essentially the same density as the surrounding water. A given quantity of water, temporarily larger in volume but correspondingly less dense because it has frozen, returning to the liquid state will thus not raise the overall level of water (assuming here no evaporation). I learned this from a Sonoran tribesman while in Mexico doing some post graduate research on native psychotropic plants. While my explanation is slightly scientific (in layman terms), his explanation was based on the arcane effects of the mystic world. Either way, it amounts to the same thing. Antarctica melting & flooding the Earth is no different than ice cubes melting in an unattended cocktail...the drink will not overflow. Dunno. If anything I’m seeing paved regions expanding into the bay in this 32 year time lapse, not the other way around. Not gonna worry about it. Keep repaving 101 and you’ve got your levy. Maybe add some tide gates a couple of places if this at some point looks like a real issue and move on. By the way, all the people who are worried about extinction events should be cheering for even more C02 emissions. Just as in the past, it would generate a bloom of life. If you are opposed to C02 emissions you should be proposing Thorium nuclear power. Renewables won't be enough to keep the waters from rising or our standard of living even in the 20th century. ReallyLiveHere is a registered user. I suggest that folks do a walk around the levees at the Baylands during the next king tide. The tops of the levees are close enough to water level that even a very modest rise in sea level will cause the bay to just flow over them. If we raise them, it doesn't solve the underlying problem, but it can buy us a century or so before the lower parts of town start having intermittent flooding. >> The tide gauges show no evidence for rates increasing to 20 millimeters per year. That's an extraordinary claim. The public works staff and the city council should be asking some very hard questions of the people who put out California's Fourth Climate Change Assessment. If only "extraordinary claim" were true in the case of climate change. Regrettably, the evidence is all around us. The rate has nearly doubled over the period of measurement, and will continue to increase, so, your linear projection is not appropriate. Web Link If we continue to burn coal at the rate we are, by the time sea level "catches up", it will be too late to stop all Greenland ice from melting. Here is a page on CO2 level: Web Link . But, if we will phase out coal rapidly and fossil fuels soon, we could still stop the planet from moving into an entirely uncharted climate regime. >> For those worried about melting Arctic ice, I recommend the following experiment instead of listening to alarmists. Greenland and Antarctica ice masses are resting on bedrock and are literally mountains of ice, containing far more ice mass than suggested by your analogy. In fact, containing enough water to raise sea level roughly 70m/230 feet. >> I suggest that folks do a walk around the levees at the Baylands during the next king tide. The tops of the levees are close enough to water level that even a very modest rise in sea level will cause the bay to just flow over them. That is correct. The system could use some beefing up right now to deal with the combination of highest tides and very prolonged wet weather. The "ice cubes melt in a glass" absurdity show the insincerity/lies of the deniers. Dumbest argument ever. Really embarrassing for the deniers. Using 150 - 200 years of history as measurement to determine earth-threatening catastrophies is insane! Yes, there is climate change, the climate has changed for MILLIONS of years. I do not understand his incessant obsession with doomsday predictions. Why is everyone so obsessed with this, so ready to jump on this crazy bandwagon? It’s as if you WANT it to be true. AOC saying we have 12 years. Really? Are you sure it’s not 11? Because if it’s 12 then I’m going to miss my sons graduation. But if it’s 11 at least he gets to graduate! > Because if it’s 12 then I’m going to miss my sons graduation. NASA and the rest of the science community give us facts, and here we have the Denier's belief structure summed up in one post. Denier *believes* it's all a conspiracy against her/him and he needs a safe space from the twin bogeymen(persons) in the form of Al Gore and AOC, a congress critter from NY. But really, it's all selfish, as noted in his response involving his son. Wonder what Son is going to think of poppy's conspiracy theories 40 years from now, as he raises his own children? No worries. Pops will be long gone, and survivors's will roundly mock (and curse) those crazy theories. So SAD! Please keep playing with your ice cubes. And talk to your son. Last 5 years warmest on record.....against millions of years a existence. Insane. I think Mother Earth has shown to be remarkably resilient. That ozone hole hasn’t gotten any bigger based on the conspiracies about CO2, pretty comfortable that I’ll be able to watch my son graduate....and even have those kids you predict! And how many times in those "millions" of years would “Momma’s” house have been under water? It's all about Abrupt vs Slow change. Abrupt change almost always highly destructive for life. Please just focus on city stuff like all the freaking crime going on around here. I would just like to walk downtown for an evening meal without worrying about getting mugged..
> Greenland and Antarctica ice masses are resting on bedrock and are literally mountains of ice, containing far more ice mass than suggested by your analogy. No different than cocktails & ice cubes resting inside a glass (alternative bedrock but on a much smaller scale). This theory has been proven in countless cocktail lounges & casinos. A glass filled with liquid & ice cubes will not overflow if unattended. > Last 5 years warmest on record.....against millions of years a existence. Insane. Apparently these Chicken Little people have forgotten about the CA drought of 1975-77. There was all this unfounded concern about California running out of water. Guess what, subsequent rainy seasons proved it was cyclical. Life is cyclical...so is nature. Global Warming was Al Gore's attempt at redemption after losing the 2000 POTUS election. He should have been elected given that he won the popular vote. Perhaps then he would have tended to more pressing matters than ice melting. > This theory has been proven in countless cocktail lounges & casinos. Using instances of weather to attack climate reality - another classic error. Compounded by conflating media attention with actual science. > Perhaps then he would have tended to more pressing matters than ice melting. More pressing than abrupt Climate Change? No. But he has done many other things as well. Look it up. Hugely successful. We should all be as successful in career endeavors. But be scared, I guess. Also: if sea level was higher in the past (it was) where did the water go once sea levels lowered? No. Another fringe right wing myth/fable/lie. I'm sorry you've been taken in on this lie. Very sad that your belief structure won't allow you to search for facts. It is really sad. > Also: if sea level was higher in the past (it was) where did the water go once sea levels lowered? Evaporation due to the warmer climates you are referring to. The added humidity equates to more seasonal storms especially in the tropics. Global overpopulation also leads to global warming. Haven't you ever been in a small crowded room or in an elevator? That 98.6F per person isn't rapidly being dissipated at room temperatures. Fewer people on Earth would reduce global warming as well & there are some countries where the birthrate should be controlled to avoid starvation. Modern medicine is partly to blame in that it is reducing infant mortality in many 3rd world/developing countries where poverty is still rampant. If one cannot afford to raise all their children, they should reduce the number of them by having fewer. Being fruitful & multiplying only applies if you have enough land, irrigation & nutrients for your orchard. + Over farming & the loss of quality topsoil is what caused the Dust Bowl in the 1930s. Farmers tried to grow too many of the same crops without alternating them & hydroponics hadn't been invented yet by Al Gore. >> Ice floats in a cocktail glass above the liquid itself. Landmass serves as the container (aka walls of the glass). >> You are correct. Al Gore also credits himself for having invented the internet. Senator Al Gore developed the Act after hearing the 1988 report Toward a National Research Network submitted to Congress by a group chaired by UCLA professor of computer science Leonard Kleinrock, one of the creators of the ARPANET, which is regarded as the earliest precursor network of the Internet. The bill was enacted on December 9, 1991, and led to the National Information Infrastructure (NII) which Gore referred to as the "Information superhighway". President George H. W. Bush predicted that the Act would help "unlock the secrets of DNA," open up foreign markets to free trade, and a promise of cooperation between government, academia, and industry. > Evaporation due to the warmer climates you are referring to. The added humidity equates to more seasonal storms especially in the tropics. Your data for that fallacy? > ...& hydroponics hadn't been invented yet by Al Gore. If one is going to fight 95% of the science community, one should bring more than a cocktail glass to said fight. Al Gore simply chose the wrong semantics. He probably should have said something along the lines of him being 'instrumental in the implementation of the internet' but he screwed up. No big deal...which is why some folks like to still joke about it (those old enough to remember). As far as ice in the ocean melting...if the ice is seriously melting, why isn't the water temperature going down instead of up? The more ice you add to a glass of water, the colder it usually gets...even if you have warm hands. Even after all the data set manipulations, an exponential increase in atmospheric C02 has shown only a moderate average temperature increase. In fact, all those claims of hottest years on record fell within the margin of measurement error. Now, as a last ditch measure the alarmists claim the relationship is not linear but logarithmic. Sometime in the always moving future just over the horizon, there will be a tipping point that will trigger a runaway heat cycle. There are scare tactics like the parts per million (PPM) of atmospheric C02 have gone up 40% since the industrial revolution (about 280 ppm to 400 ppm). What they don't tell you is that the atmospheric C02 estimates in the past when mammals first developed was between 2,000 to 4,000 ppm. That's right, based on their own calculations the levels of C02 in the atmosphere during the Triassic period were between 5X to 8X times higher than current levels. > In fact, all those claims of hottest years on record fell within the margin of measurement error. Uh-huh. 95% of the scientific community missed an error that our poster from Barron Park discovered. Yay! All fixed! And you are at least not yakking up that dumb cocktail glass fantasy. Since you have discovered that error, we're guessing you can link a couple peer-reviewed studies proving all that tripe? Global warming is purely a theory & not a law of science. The global warming 'warning' advocates & deniers have both presented valid points in support of their arguments. The bottom line is...as humans, we don't know the absolutes of anything. That is why gambling is a popular pastime among various cultures both primitive & modern. We are wagering with the unknown & unproven. As a result, all proposed concepts are valid as one will choose to believe whatever they elect to (i.e. religion, science & metaphysics et al). Personally speaking, I have found that it is oftentimes best to assume that everything is BS upon further recognition & acknowledgement whether empirical or spiritual. That said, the global warming alarmists can continue their advocacies...meanwhile I will stir the ice cubes in my Meyer's Rum & OJ & watch the drink level go down. "The bottom line is...as humans, we don't know the absolutes of anything. That is why gambling is a popular pastime"
I love having deniers of science/math at our weekly poker game. Don't believe in theory or measurements? Come on over to our Monday night game! I have to agree with AnthroMan. My greatest concern about the future is the increasing abundance of copycat opinion, unsupported by original thought. >>"...The rate has nearly doubled over the period of measurement..."
It's interesting to note that the rate of sea level rise for the last 112 years is linear and projects out to an increase of about 6.3 inches by 2100, but it's 10.2 inches if you include all 164 years. In any case, it's not 20 mm/yr quoted in the Palo Alto OnLine story. Whenever I hear "95% of climate scientists agree", I know that the argument is going to be 100% propaganda and talking points. Fortunately, it is easy to show how the headlines are manipulated. One simply has to look closely at the actual numbers in the articles. Frequently they are buried several paragraphs down or in the foot notes. The temperature differences reported are measured in 100's (two decimal places) and the margin of error is measured in 10'S (one decimal place). So saying that 2016 was the warmest year on record was like saying the ball was 1st and goal on the 10 yard line give or take a football field. When confronted with those misleading tactics, the climate misleaders usually fall back to saying it is the trend that really matters and not one particular year or another. Then, when the trend is down rather than saying the average year over year temperature declined, they say it was the fourth warmest year on record. The real inconvenient truth is that our planet has traditionally been warmer than it is now, the atmosphere has had higher concentrations of C02 than it does now, we can't measure globally with enough precision to escape the margin of error and we have not been doing it long enough to draw a high confidence conclusion. So the weekly censors everybody who sees through its liberal bias and exposes the truths of the warming and sea level hoax. Some day it will have to apologize and face up its liberal error. Remember Paul Erlich's 'Population Bomb' from the 1970s? Earth was going to be overun by masses of humanity which would trigger the Mathusian Theory to an even greater extent. Well it turned out to be more along the lines of shrapnel rather than an actual biological time bomb as war, starvation, disease & infant mortality are still around to keep things in check. What Erlich didn't foresee was that in the countries where this was a potential problem, the inhabitants simply immigrated to the United States! Next came 'Acid Rain' in the 1980s which was supposed to defoliate the entire Earth...again over time. Now we have global warming. The polar ice caps are melting with the resultant sea level rising & warmer global climates as some have reported. So tell that to someone who lives in the Dakotas or Siberia during the winter months. Like the previous highly-publicized & unsubstantiated disaster predictions...it essentially depends on where one resides...definitely not a universal & should not be construed as one. To Sanctimonious City: You are pretty much clueless (charitably one could say ill-informed) on the issue of anthropogenic climate change. What you write are essentially the fossil-fuel funded talking points of the Heartland Institute (also as promulgated by Fox News et al.). Why not start by informing yourself on the science? A good starting point might be the American Geophysical Union statement on climate change: Web Link - it has numerous resources you could use to inform yourself. Oh, and you can leave off the anonymously libelous comments about climate scientists being corrupt and only claiming anthropogenic climate change is important to get funding. Speaking as someone who knows many climate scientists, this is simply not true, full stop. > Whenever I hear "95% of climate scientists agree", I know that the argument is going to be 100% propaganda and talking points. But by all means, listen to the anonymous posters attacking "measurements" because of their beliefs. My favorite quote from your reference link to supposed experts is a group of Geologists cautioning "mental health implications" from global warming. Well, if some of the posts about climate change are any measure then perhaps we are already seeing its effects. Well, let's just forget all the historical data about previous higher temperatures and levels of atmospheric C02. We can also put aside the issue that we haven't even had a global infrastructure to measure the temperature of entire planet until the mid-1990s. Don't worry about correlation coefficients or margins of error or even the dozens of invalidated forecast models and predictions. Let's just focus on one thing. How accurately can you predict the average daily temperature on your own patio porch within two decimal points next week, next month, next year and then 100 years from now? Congratulations if you think you can do it. Now try it for the Earth with a oceanic volume of 1.4087 billion cubic kilometres and an atmospheric volume of 5140 trillion tonnes. Remember, if you are wrong it will cost you 100s of trillions of dollars in climate mitigation costs just to attempt to keep the current climate below what it was in the geologically recent past. Also, if other countries cheat or it is part of a naturally occurring return to normal states after the last cold cycle then it will all be all for nothing anyway. Nietzche famously said, "God is dead" with the implication being that some other moral code would need to be created to replace religion after the Enlightenment. For some it is simply Nihilism. For others it is obviously Climate Change. > Earth’s climate is now changing faster than at any point in the history of modern civilization, primarily as a result of human activities. Going back to a hunter-gatherer primitive society which places minimum stress on the environment. In other words, the Industrial Revolution was a curse on humanity. Though a fictional portrayel, the Flintsones did not have to concern themselves with global warming as they were not reliant on modern-day conveniences as everything was either man or animal powered/propelled. Perhaps this is the ultimate solution but being 21st century people, there is no need to to go to extremes. A return to a Gemeinshaft society should do the trick...an agrarian village environment where commodities are hand-made & the townspeople relatively self-sufficient. Think 14th Century. Are we as humans willing to make that committment? Can we convince large manufacturing countries such as China to do the same? Are we willing to give up all our 'creature comforts' to save the world for centuries later?